I've posted several guest posts by Dr. Scott Monteith, a psychiatrist/informaticist, at Healthcare Renewal. These include the Mar. 2011 post "On 'The Best Compromise' on Physicians and Use of Troublesome Health IT", the Jan. 2011 post "Interesting HIT Testimony to HHS Standards Committee, Jan. 11, 2011, by Dr. Monteith" and the Dec. 2010 post "Meaningful Use and the Devil in the Details: A Reader's View". New Drug on the market! This new drug claims to be incredibly effective. It’s very expensive, but the sellers assure us that it’s worth it! Using the drug is complicated, and the health care team will likely experience side effects including frustration, reduced efficiency, fatigue, lack of attention, confusion, and cognitive dissonance (as the drug often “appears” not to work -- but it really does work and we know because the manufacturers consistently tell us it does). By the way, the sellers of this new drug say that side effects are the fault of the people who use the drug, not the drug itself. The drug isn’t proven to work, but its investors view it as promising and tell us that this small detail can be ignored. Besides, it would be costly to prove that it’s effective (remember, it’s already a very expensive drug). And there are case studies showing that it appears to work. Some people reportedly really like it (these people, in fact, often become drug salesmen). Never mind that there are also large numbers of case studies indicating that it’s ineffective and dangerous, and can even kill people. Nor do we have clear best practices related to correct dosages and when to take it, but the drug’s producers tell us that more of the drug is generally better than less. Everyone will have to figure out these minor details on their own. It’s recommended that you hire experts to help you with this detail. No problem – there are experts around every corner (they’re called “consultants”). Please join the manufacturers in their campaign to use and promote this new drug – the government has! Uncle Sam will pay you an incentive to use this new experimental drug over the next few years. If you refuse to use it, however, beware! Uncle Sam will penalize caregivers who refuse to use the drug by reducing their payments by 1% in the first year, and then accelerating these reductions in years 2-5. Almost forgot…once you start the drug, it’s very hard to quit to using it. No, it’s not heroin. Don’t be silly! The generic name is “HIT.” The trade name is “EHR.” It’s stock symbol is ONC. I think the point is very well made. Cybernetik Über Alles: Computers Have More Rights Than Patients? What medical devices are shielded from liability? Are there other examples of legislation seeking legal protections for wide-scale use of medical devices that even the device's trade group leadership admits are not ready, and are experimental? Here we have a proposal from a member of the U.S. Congress to shield health IT software, a medical device (per FDA's Director of CDRH - the Center for Device and Radiological Health and others), and its users from liability through an apparently unique special accommodation. On Wednesday, Rep. Tom Marino (R-Penn.) introduced legislation (HR 3239) that would create certain legal protections for Medicare and Medicaid providers who have implemented electronic health record systems, the Wilkes-Barre Times Leader reports. The bill -- called the Safeguarding Access for Every Medicare Patient Act -- would create a system for reporting potential medical errors that occur when using EHRs, but it would not allow such information to be used as legal admission of wrongdoing. The bill would cover certain physicians and hospitals that serve Medicare and Medicaid beneficiaries. It also would cover participants and users of health information exchanges. He said, "Many providers are reluctant to use [EHRs] because they believe the practice will make them more vulnerable to unnecessary legal action," [unnecessary? How about real and necessary, as per the White Paper Do EHR's Increase Liability? - ed] adding, "This [bill] protects access for seniors in the Medicare and Medicaid programs" (Riskind, Wilkes-Barre Times Leader, 10/27). HR3239, the Safeguarding Access For Every Medicare Patient Act, would ensure patient access to Medicare and Medicaid providers; reduce health care costs [really? That's not what Wharton and others write - ed. ]; guarantee incentives to providers to remain in the Medicare and Medicaid programs; and promote participation in health information technology. Providers will eventually be required to participate in electronic recordkeeping or face a reduction in payments. Marino said the bill offers incentive in the form of legal protection to providers who may be reluctant to remain in the Medicare and Medicaid programs due to low reimbursement rates which are constantly being targeted for further reductions. It also prevents electronic records from being used as an easy source for “fishing expeditions,’’ [like this case, this case, this case and this case where patients died? - ed.] while making sure that parties responsible for errors are held accountable [how? -ed]. The proposal allows for providers who use electronic records to take remedial measures without having those actions be used to establish guilt [even though remediation may be very relevant to malpractice, patient injury and death prior to the remediation, and the remediation is informed by the error - ed. ]; places time limits on the filing of lawsuits; and offers protection against libel and slander lawsuits. This sounds like a healthcare IT vendor marketing piece, with claims refuted repeatedly here at HC Renewal, usually via the biomedical literature. It's slick, purporting to "protect Medicare access" while actually promoting health IT sales. What are the patients and their rights to redress for injuries that occur due to EHR's? Chopped liver? Isn't this bill really saying that patients are experimental subjects with limited rights? In other words, that improving EHR's should be at the expense of the unfortunate patients treated under its auspices? That the computers have more rights than the patients? That line of thinking about what in reality is unconsented medical experimentation (i.e., "First, let's experiment" as opposed to "First, do no harm") has led to some very dark places in medicine, and not just in ancient history (e.g., see "Bioethics panel blasts late U. Pittsburgh professor"). See this reading list for more on these issues. Also see the many other posts on this blog about health IT quality, usability, efficacy, risk (and that the levels of that risk are admittedly unknown), lack of informed consent, and other issues via query links such as here, here, here and here - and the hyperlinks within those lists of posts - to more fully understand this perspective. The text of the proposed legislation is here. While not all bad, it raises a number of concerns. To provide certain legal safe harbors to Medicare and Medicaid providers who participate in the EHR meaningful use program or otherwise demonstrate use of certified health information technology. ... SEC. 4. RULES RELATING TO E-DISCOVERY. (2) information from the period in which such EHR-related adverse event occurred. SEC. 5. LEGAL PROTECTIONS FOR COVERED ENTITIES. (iii) the presence of a foreign body, which has no therapeutic or diagnostic purpose or effect, in the person of the injured person. (C) for purposes of this paragraph, the trier of fact shall determine the proportion of responsibility of each such party for the claimant's harm. (3) SUBSEQUENT REMEDIAL MEASURES- Evidence of subsequent remedial measures to an EHR-related adverse event with respect to certified EHR technology used or provided by the covered entity (including changes to the certified EHR system, additional training requirements, or changes to standard operating procedures) by a covered entity shall not be admissible in health care lawsuits. (4) INCREASED BURDEN OF PROOF PROTECTION FOR COVERED ENTITIES- Punitive damages may, if otherwise permitted by applicable State or Federal law, be awarded against any covered entity in a health care lawsuit only if it is proven by clear and convincing evidence that such entity acted with reckless disregard for the health or safety of the claimant. In any such health care lawsuit where no judgment for compensatory damages is rendered against such entity, no punitive damages may be awarded with respect to the claim in such lawsuit. (5) PROTECTION FROM LIBEL OR SLANDER- Covered entities and employees, agents and representatives of covered entities are immune from civil action for libel or slander arising from information or entries made in certified EHR technology and for the transfer of such information to another eligible provider, hospital or health information exchange, if the information, transfer of information, or entries were made in good faith and without malice. From an ethical perspective, when you know a technology can be unsafe, but you don't know the levels of risk it creates, and the literature is conflicting on the benefits (prima facie evidence the technology is still experimental), you do not promote its wide-scale use in medicine and offer special accommodations to the technology's producers and users. Period. This is especially true without explicit patient informed consent and opportunity for opt-out. To promote such technology is not ethical. Note: I believe the misunderstanding of "certification" of health IT contributes to the problems with such proposals. "Certification" of HIT has little if anything to do with safety, reliability, usability, etc. (e.g,, see http://hcrenewal.blogspot.com/2010/03/on-oncs-proposed-establishment-of.html). This Representative seems to represent districts in Pennsylvania served by the Geisinger healthcare system, including Danville, PA where their main campus is located. His legislative assistant on healthcare represented Geisinger to me in a conversation today in glowing terms. However, I suggest that Geisinger does not have a perfect track record, e.g., see the post "A 'safe' technology? Factors contributing to an increase in duplicate medication order errors after CPOE implementation" and its reader comments and links. It occurred to me that in the post "Is Healthcare IT a Solution to the Wrong Problem?" referencing a study published in the Nov. 25, 2010 New England Journal of Medicine entitled "Temporal Trends in Rates of Patient Harm Resulting from Medical Care" [Landrigan N Engl J Med 363;22] I pointed out that the abilities of health IT to "reduce medical error" may be significantly less than imagined. This is because most medical errors have little to do with record keeping, but instead with human factors. See the post at http://hcrenewal.blogspot.com/2010/12/is-healthcare-it-solution-to-wrong.html. Doctor Placed on Administrative Leave ("Railroaded?") Because He "Fell Behind on Handling Electronic Records For His Patients"
LINCOLN — A Lincoln doctor who was removed from his job a month ago says his bosses in Springfield failed to train him properly on a new electronic medical-records system. An official with Memorial Health System disputes the doctor’s claims. Dr. Steven Kottemann, 63, who was placed on paid administrative leave Sept. 16 by Springfield-based Memorial Health System, wants to return to his $100,000-a-year position as a family physician at Family Medical Center of Lincoln, 515 N. College St. I think it appropriate to question whether an EHR mission hostile user experience may be creating a liability for the clinic. Also see the semi-rhetorical question-titled White Paper "Do EHR's Increase Liability?" (PDF). Memorial’s chief medical officer, Dr. Rajesh Govindaiah, said Kottemann has been treated fairly. Though Govindaiah wouldn’t go into specifics, he said concerns about Kottemann’s performance go beyond his proficiency with electronic medical records. Was this Sham Peer Review? That sounds like an excuse, considering the patient testimonials in the article and on the linked Facebook page mentioned below. FDA chimes in that injuries and deaths are reported, but the magnitude is not known; however they won't regulate a technology that is a "political hot potato." Looking at FDA's MAUDE database on just about the only health IT vendor who reports there (it's voluntary) makes my hair stand on end. See "MAUDE and HIT Risks: What in God's Name is Going on Here?" Further, the literature is conflicting on benefits of EMR's (see my post "An Updated Reading List on Health IT"). Who, exactly, is promoting patient safety? "Railroading" seems like a better term. Kottemann, who grew up in the Chicago area, moved to Lincoln in 1977. He has practiced in Lincoln his entire career and says he is the oldest practicing physician in the Logan County seat. But he has no plans to retire. His patients have come to his defense, creating a Facebook page and sending letters to Memorial officials. Another patient, Fern Donnan of Beason, said Memorial officials should be more understanding. “Technology is a learning curve, and you need to allow for that and support that,” she said. Donnan said she and her family members will avoid Memorial health-care providers unless Kottemann is reinstated. “I don’t know why they’re pushing him out,” she said. Perhaps because he just won't cave in using the health IT that has been forced upon him, and upon his patients (without their informed consent, I might add). See my post "Draft Patient Rights Statement and Informed Consent on Use of HIT." Kottemann said he fell behind because the new system wouldn’t accept his dictated notes after he saw patients in the office. The system’s computers were supposed to accept dictation, he said. But he said he learned after several weeks that the system was mistakenly deleting dictations. He said he told his supervisors about the problem, but when there was no response [because it's the user's fault - ed. ], he was faced with the other main option — typing notes into the system while he sat with patients in exam rooms. As a result, he decided not to attempt to type during patient visits. With dictation not an option, Kottemann for several months would go to the office before regular business hours and stay after the office closed in order to type in his notes. “It got to the point where I was going in seven days a week to keep up,” he said. The doctor was serving the computer; it became his master. Memorial sookesman Michael Leathers said no other doctor in the Lincoln clinic who used the new system’s dictation option lost any dictations. Kottemann said a Memorial official put him on administrative leave without warning last month. Govindaiah said “mutually agreed-upon targets for performance” weren’t being met. Memorial placed Kottemann on a “paid leave of absence in order to address our concerns and to identify why we weren’t making any progress,” Govindaiah said. Again, was this sham peer review, or was full and fair due process being followed? Kottemann said he knows his slowness on the system eventually could have compromised the care of his patients, but he wouldn’t have gotten behind if he had been better trained and if the dictation system had worked. It is well known that hospitals skimp on training. Govindaiah said Memorial did provide additional training and scribes to help him keep up. But Kottemann said the scribes lacked medical knowledge, so he couldn’t rely on them. Indeed. See my post "The Ultimate Workaround To Mission Hostile Health IT: Humans (a.k.a. "Scribes"). After being put on leave, Kottemann said he was cleared to return to work by a Bloomington psychologist and a Springfield occupational-medicine specialist. Those evaluations were requested by Memorial, he said. After those evaluations, Kottemann said Memorial also wanted him checked out by a neuropsychologist. Kottemann said he has refused this evaluation because he now believes Memorial officials are trying to have him declared impaired so they can fire him. Could this be a case of constructive discharge as well? Kottemann said he scored among the top 1 percent of family medicine specialists in the 2009 exam he took to renew his board certification. But, the computer doesn't like him, so out he goes? ... Kottemann said he doesn’t know what will happen next, but he has secured legal representation when dealing with Memorial in the future. “I want to see my patients, and they want to see me,” he said. But the computer doesn't want to see you. You're just not adapting to its deficiencies properly. Electronic medical-record systems aren’t perfect, and questions about whether they improve patient care and save money haven’t been answered conclusively, but doctors must try to adapt to the systems, the president of the Illinois State Medical Society says. IT designers and implementers need to first adapt to doctors, not the other way around, I say to the Medical Society President. And it's OK for technology to be bedeviled by details...when the subjects are lab rats, not unconsenting human subjects, I say to the anesthesiologist. Hospitals are not IT beta testing and development shops. Doctors’ everyday use of electronic records is important for clinics and hospitals to qualify for millions of dollars in federal incentive payments and to avoid financial penalties in the future. But Polek said it shouldn’t be surprising that some doctors find the transition difficult. This is an experimental technology. THIS - IS - AN - EXPERIMENTAL - TECHNOLOGY. "Current Approaches to U.S. Health Care Information Technology are Insufficient" and that the technology "does not support clinicians' cognitive needs." The study was chaired by Medical Informatics pioneers Octo Barnett (Harvard/MGH) and William Stead (Vanderbilt). EHR's also may facilitate record spoliation and make upcoding/overbilling easier. See my post "Does EHR-Incited Upcoding (Also Known as "Fraud") Need Investigation by CMS, And Could it Explain HIT Irrational Exuberance?" on the latter. “A lot of us, even if we’re doctors, have problems programming a VCR,” he said. Perhaps the user experience of the VCR, like that of many EHR's, CPOE's etc., is mission hostile. Dr. Gayle Woodson, 61, a surgeon who is president of the Sangamon County Medical Society, said she is convinced electronic records can improve patient care by making information more accessibly and, in some cases, helping physicians avoid errors. And what about the errors they promote? “It’s always a pain to do something different, but it’s not so hard,” she said. Really? How is that you speak for everyone regarding use of clinical IT and the cognitive issues, distractions, and difficulties it creates for many? E.g., see my post "An Honest Physician Survey on EHR's." Springfield Clinic deploys a group of nurses specializing in “clinical informatics” who help doctors with the clinic’s electronic record system, chief clinical officer Mary Stewart said. What is their formal training in the field? Why no physicians specializing in Medical Informatics, such as those postdoctorally trained in the field? Too expensive, perhaps? See my post "ONC Defines a Taxonomy of Robust Healthcare IT Leadership." Hospital Sisters Health System, which operates St. John’s Hospital, finds that some doctors have more difficulty than others in the transition to electronic records, spokesman Brian Reardon said. “Doctors who are older need more attention,” Reardon said. Welcome to the legions of the Masters of the Obvious. - Or, have EHR's become a form of medical age discrimination, to root out those "old docs" who adhere to all those quaint relics of yesteryear (such as the Hippocratic Oath)? I believe Dr. Kotteman should defend himself vigorously on the issues I bring forth in this post. He should also demand data on near misses, patient injuries, and even patient deaths caused by the EMR he is being coerced to use, whether within his center or at other customer sites. Let the IT adapt to the doctors, and let the patients consent to its use in their care after being made fully aware of the downsides (as at my reading list). Mike Leavitt, the former Governor of Utah who also oversaw the Food and Drug Administration for four years, has been elected to the board of Medtronic Inc.
Leavitt is the founder and chairman of Leavitt Partners, which advices clients in the healthcare and food safety sectors, according to a news release from Fridley-based Medtronic (NYSE: MDT). He served as governor of Utah from 1993 through 2003. Former President George W. Bush appointed Leavitt administrator of the Environmental Protection Agency in late 2003 and secretary of Health and Human Services in January 2005. Leavitt served in that position into January 2009. At Health and Human Services, he oversaw the FDA and the Center for Medicare and Medicaid Services — two agencies that are important to Medtronic, which makes medical devices. Note that Mr Leavitt's official Department of Health and Human Services biography listed no training or experience in direct health care (or in biomedical sciences or the engineering of health care devices, for that matter.) Before he was Secretary of HHS, he was Governor of Utah, and before then, he was the CEO of an insurance company. Since I very much doubt Mr Leavitt is a large Medtronic shareholder, it would appear that the rationale for his position on its board is his conectedness with other powerful health care insiders. Mr Leavitt did not transit the revolving door as quickly as did other health care leaders from that administration. We noted in 2010 that the leaders of the US Food and Drug Administration (FDA), US National Institute of Health (NIH), and US Centers for Disease Control (CDC) at the end of the Bush administration had already gotten powerful positions in the health care corporate world. Mr Leavitt is not the first recent former Secretary of HHS to become the director of a big health care corporation whose fortunes may be affected by what HHS does. We noted in 2011 how rapidly the Secretary of HHS at the end of the William Clinton administration, Donna Shalala, signed up as a director for UnitedHealth. We have also noted a variety of other examples of the revolving door phenomenon. These examples suggest how the leaders of government health care agencies and health care corporations are becoming interchangeable, forming a giant embedded network of influence. Furthermore, they suggest how top government health care leaders can now expect a cushy corporate position to open up as soon as they can legally accept it. Whether government leaders who expect such future job opportunities will avoid offending possible corporate employers while in office, even if giving such offense would be good for patients' or the public's health, is an open question. The answer, I fear, may be obvious. These examples suggest that the US is becoming increasingly corporatist, a country dominated by an unholy alliance between top leaders of government and of large corporations, who are becoming increasingly interchangeable. Another way of putting it is the country is increasingly dominated by an insider elite that manipulates the system for its own benefit. neither the CEO nor the lobbyists were paid what they earned, nor were they compensated in a way that made the relevant stakeholders better off. Instead they were taken care of in a way that reflected their elite insider status and their ability to take advantage of wrinkles in the system while breaking no laws. In both cases, less politically connected people -- other Gannett employees, Gannett shareholders, readers of Gannett newspapers, Illinois school teachers, and Illinois taxpayers -- were unjustly made worse off by what transpired. And isn't the overlapping ethic that guided the behavior of these people a big part of what's wrong with America? Behavior like theirs is one reason Americans on the right and left have recently taken to the streets. Ours is a society that has always tolerated inequality of wealth; and so long as some imperfect degree of fairness is maintained in the getting of material goods, the system functions smoothly. But if people feel that wealth they struggled to earn is being taken from them to pad the nest eggs of dishonorable union lobbyists; or that they're at risk of being fired from their $14 an hour job if they're ten minutes late, whereas their ultimate boss retires with an eight-figure package after presiding over plummeting stock prices and massive layoffs; people put in situations like that eventually revolt, if they've concluded that injustice is the norm rather than an aberration. I would propose that the fundamental injustice of having an insider elite run health care so as to put their self-interest first is the basis of what has gone wrong with health care (and the rest of the country, and maybe the world.) If we do not have the courage to first say this out loud, and then restore some rationality and justice to the structure and leadership of health care, the spiral will continue downward. I expect if any of the insider elite's defenders bother to read this, one argument they might propose is it was always thus. How can one expect people who work as government leaders for a short time not to take advantage of the best possible job offers when they leave? My answer is that an admittedly cursory look at history suggests it has not always been thus. Using Wikipedia as an imperfect but quick source, I found that Joseph A Califano Jr, the last Secretary of Health, Education and Welfare under President Carter worked at a law firm, founded the National Center for Addiction and Substance Abuse, and wrote books after he left office. He did serve on a corporate board (CBS), but not for a health care corporation. Patricia Roberts Harris, the first Secretary of HHS under President Carter, became a law professor. Dr Otis R Bowen, the last Secretary of HHS under President Reagan, retired after that, but served on some non-profit boards and government committees. The recent in-depth investigation by Fortune reporters of 10 years of dysfunctional leadership at Pfizer, the "world's largest research-based pharmaceutical company," raised many issues about leadership and governance in health care (see our post here). In a series of posts, we then discussed lack of transparency in Pfizer's communication about management performance here, how bad management was rewarded with outsize compensation here, and how a board of directors dominated by members of the "CEOs union," with a number of apparent conflicts of interests and multiple ties to the financial firms that brought us the "great recession," seemed happy to continually reward poor executive performance here. A recent article also serves as a reminder that Pfizer's dysfunctional leadership and stewardship coincided with an amazing series of ethical missteps. Just the latest legal settlement by Pfizer appeared in the Washington Post (from the AP). The drugmaker Pfizer Inc. has agreed to pay the government $14.5 million to settle charges it illegally marketed its drug for a condition called overactive bladder. The settlement disclosed Friday resolves the last of 10 whistleblower lawsuits, dating back to 2003, that claimed Pfizer marketed a number of its prescription medicines for unapproved uses. Pfizer agreed to pay $2.3 billion in September 2009 to settle both criminal charges and civil claims in many of those cases. The rest were dismissed. In the final case, Pfizer was accused of marketing overactive bladder drug Detrol for men with enlarged prostates and related conditions including bladder obstruction. The drug wasn’t approved for those uses. the company has put 'numerous controls and oversight mechanisms in place to ensure compliance with state and federal laws,' including a corporate compliance committee. Based on recent history, it seems unlikely that the company will be able to stay out of trouble. This settlement is just the latest chapter in a long story of misbehavior. Pfizer paid a $2.3 billion settlement in 2009 of civil and criminal allegations and a Pfizer subsidiary entered a guilty plea to charges it violated federal law regarding its marketing of Bextra (see post here). Pfizer was involved in three other major cases from then to early 2010, including two involving settlements of fraud charges, and one in which a jury found the company guilty of violating the RICO (racketeer-influenced corrupt organization) statute (see post here). The company was listed as one of the pharmaceutical "big four" companies in terms of defrauding the government (see post here). Pfizer's Pharmacia subsidiary settled allegations that it inflated drugs costs paid by New York in early 2011 (see post here). In March, 2011, a settlement was announced in a long-running class action case which involved allegations that another Pfizer subsidiary had exposed many people to asbestos (see this story in Bloomberg). By my count, Pfizer made nine separate settlements from 2002 to 2011. Some other bad behavior by Pfizer that did not necessarily result in legal action can be found under our label "Pfizer." Looking at a summary of this bad behavior, it seems remarkable that no individual in a leadership position at Pfizer has suffered any obvious negative consequence of these events, that Pfizer's whole leadership has not been forced to reorganize, maybe even that the company is still in business. Naively, one might ask why trust a company with such a track record? Why is there not so much mistrust of this organization that it could no longer continue business as usual? Yet, while as noted in previous posts, Pfizer has not had the best financial results, and has gone through several CEOs, the company has made no fundamental changes in its leadership or governance despite this sorry history. Perhaps one reason for the lack of response to these events is that they have not previously been presented together so that their pattern is evident, as we did above on Health Care Renewal. It is true that in 2009, then Pfizer CEO Jeffrey Kindler acknowledged the company has had ethical lapses, and called on government and industry leaders in general to face up to ethical breaches or else the people would find a way to force changes upon them (see post here.) However, not even then did Kindler detail Pfizer's own troubled history, and he did not last much longer as CEO. I have not found any other publication that puts together the list of bad behaviors that appears above. Most publications in business sections of the news media focus on only the most recent lapses. The medical, and health care/ services/ policy research literature generally ignores these issues entirely. So here is the tragedy of the anechoic effect. Because it is still simply not done to talk about the poor stewardship, bad leadership, and ethical misadventures of big health care organizations, the dysfunction just continues. As long as we fear to even talk about what has gone wrong with the leadership and governance of health care, how are we ever going to make any real improvements? I have often had to respond to those who claim that EHR's don't cause medical errors, users do. That subset of the health IT irrationally exuberant seem common in the health IT industry and pundit channels. NIST (The U.S. National Institute of Standards and Technology) has recently issued a draft report "NISTIR 7804: Technical Evaluation, Testing and Validation of the Usability of Electronic Health Records." It is available at http://www.nist.gov/healthcare/usability/upload/Draft_EUP_09_28_11.pdf (PDF). The report is quite negative concerning the low usability of today's commercial health IT, and recommends significant improvements that have been standard practice in other mission- and life-critical IT sectors for decades. I will have more to write about this report, but I found a passage and footnote early in the report striking. The EUP (EHR usability protocol) emphasis should be on ensuring that necessary and sufficient usability validation and remediation has been conducted so that use error  is minimized. “Use error” is a term used very specifically to refer to user interface designs that will engender users to make errors of commission or omission. It is true that users do make errors, but many errors are due not to user error per se but due to designs that are flawed, e.g., poorly written messaging [or lack of messaging, e.g., no warnings of potentially dangerous actions - ed. ], misuse of color-coding conventions, omission of information, etc. This passage describes what I have termed a mission hostile user experience. "Blame the user" as the default, reflex reply to clinical IT-related medical errors, and the "hold vendor harmless for defects" clauses that facilitate this excuse are now heading to the junkpile - in the clinic, hospital, and courtroom. It is my hope that the the Wild West, free-for-all, cavalier, get out of jail free days of the health IT industry are coming to a close. If you’re going to improve vendor design, it has to begin with an internal commitment to value designers and what they contribute to the product development process. They can not be an afterthought. There are very few companies with this mindset. Almost all HIT companies are developer-driven, so the first thought, and one that is promoted in this report, is to turn developers into designers. This will not work! A developer and a designer require two fundamentally different skill sets that are not easily transposed. Developers are trained to think rationally and analytically; design requires empathy for the user. In health IT, empathy for the patient as well, I might add. Brilliant computer innovators may not be so brilliant in all domains. It is well known, and well documented for many decades, that pancreatic cancer is often extremely aggressive and detected relatively late due to lack of early symptoms. Its detection should lead to aggressive treatment ASAP, such as radiation/chemotherapy or the Whipple procedure, if the person is to survive. ... His early decision to put off surgery and rely instead on fruit juices, acupuncture, herbal remedies and other treatments — some of which he found on the Internet — infuriated and distressed his family, friends and physicians, the book says. From the time of his first diagnosis in October 2003, until he received surgery in July 2004, he kept his condition largely private ... Mr. Jobs put off surgery for nine months, a fact first reported in 2008 in Fortune magazine. (Per Yahoo finance) ... he also was influenced by a doctor who ran a clinic that advised juice fasts, bowel cleansings and other unproven approaches, the book says, before finally having surgery in July 2004. I would replace the term "doctor" above with the onomatopoeia imitating the noise made by females of the species Anas platyrhynchos. Medical mysticism and "alternative therapies" may have their place, especially in hypochondriacs and for relatively minor problems (in my view, via the placebo effect), but not in dire, well studied conditions such as cancer of the pancreas. A brilliant computer entrepreneur, one of the world's best, may have been unnecessarily lost due to the seduction of medical mysticism. In such diseases, sadly, an Apple a day does not keep the doctor - or the grim reaper - away. 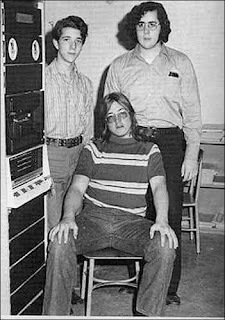 Me (standing, right), Eric Benshetler (standing, left), and Hank O'Neill (sitting), 1973. Hank had a distrust of medicine. I last saw him when I was in Residency, when he visited my home to see my ham radio setup. He became a programmer working on military weapons systems, the B1B bomber I was told. I was told this, unfortunately, at his funeral just a few years ago. He'd developed a severe respiratory infection and tried to "tough it out." He died at home, apparently of pneumonia. A few dollars worth of antibiotics would probably have saved him. At the funeral, his friends told me he spoke occasionally of his former computer friend who'd gone into medicine. I was quite sad at his funeral. All he'd needed to have done would have been to call me. I'm sure I could have talked him into treatment. At Roy Poses' cross post "Why 99 percent of health care should be angry" over at the KevinMD blog, I introduced a comment into the "eruption of controversy" (his term here) caused by his post. As one of Roy Poses' co-bloggers and a Medical Informaticist, I can say with certainty that government involvement in healthcare has been disastrous. Specifically, via ONC, ARRA and the HITECH Act, prematurely pushing still-experimental healthcare information technology on an unsuspecting medical profession (for the most part) and public. See "An updated reading list on health IT" at http://tinyurl.com/emrreadingl..., . What are you basing your "certainty" on? The examples discussed in the links sound like a case of bad configuration of an EMR. It could also be a just a poor solution from a vendor. Do you know if these were even a certified applications? I would like to suggest not painting all EMR implementations and the overall value of EMR’s from a single, albeit tragic, example. [I.e., an "anecdote" - ed.] A well implemented EMR, configured in collaboration with an organization’s physicians, has been repeatedly proven to reduce medical and medication errors. Why would any educated person, including legislators and executives, support the use of a tool that would increase harm, not safety. "That it will ever come into general use, notwithstanding its value, is extremely doubtful because its beneficial application requires much time and gives a good bit of trouble, both to the patient and to the practitioner because its hue and character are foreign and opposed to all our habits and associations." - The London Times, 1834 commenting on the "stethoscope"
Note that this reply came after I presented a link to a long list of articles, more than 50, with links to each article or its abstract for ease of reference, and a personal account of healthcare IT failure. The articles challenge the beliefs in technological determinism common about health IT, i.e., that computers + medicine 'automagically' lead to better medicine, because, well, of the addition of computers, which must improve medicine, just - because. The reason I write that the reply was typical of the irrationally exuberant is due to the interrelationship between irrationality, logical fallacy, and absence of evidence. These characteristics are usually present in the writings proffered by those so afflicted - and, to those with vested interests in health IT, a.k.a. conflicts of interest, I should add. You are lacking references supporting your arguments, which in themselves display logical fallacy. I urge all readers to see my linked references list at the top of this thread, examine some of them (such as Jon Patrick's work on gross EHR defects, the ECRI Institute's Top Ten List of Healthcare Hazards, Romano et al. 's "Electronic Health Records and Clinical Decision Support Systems: Impact on National Ambulatory Care Quality" and others). There are articles from reputable sources indicating today's health IT, lacking cognitive support and other necessities for clinicians (such as per the National Research Council itself in an investigation led by health IT pioneers Octo Barnett and William Stead, see http://www8.nationalacademies.... ) does not improve quality of care, and can cause harm. Re: "The examples discussed in the links sound like a case of bad configuration of an EMR" - you omit the existence of clinical IT defects and problems such as poor software engineering causing unreliability, mission hostile human-computer interfaces (e.g., see http://www.tinyurl.com/hostile... ), incorrect or incomplete decision support algorithms, terminological problems, and other issues. You seem to indicate the findings in the reading list may be "anecdotal." A crushing reply to that line of thought, from an expert in Australia, is here: http://hcrenewal.blogspot.com/... .
As far as "certification" of HIT, this has little if anything to do with safety, reliability, usability, etc. ( e.g,, see http://hcrenewal.blogspot.com/... ). "Certification" of health IT is not validation of safety, usability, efficacy, etc., but a pre-flight checklist of features, interoperability, security and the like. The certifiers admit this explicitly. See the CCHIT web pages for example. You use the logical fallacy of "appeal to authority" - or show severe naivete - in asking "why would any educated person, including legislators and executives, support the use of a tool that would increase harm, not safety." "We need to embrace technology and make it work for us rather than putting our heads in the sand" - I ask - why now, if the technology is not ready? This seems like an appeal to novelty and perhaps the bandwagon fallacy (see http://www.nizkor.org/features... ). Regarding your 1834 London Times quote, that was in a time before the human subjects experimentation guidelines such as the Belmont Report, World Medical Association Declaration of Helsinki, Guidelines for Conduct of Research Involving Human Subjects at NIH, the Nuremberg Code, and others came into being. We as a society have supposedly learned something since 1834 regarding experimental medical devices. Or have we? FDA's Jeffrey Shuren MD, JD, Director of CDRH has admitted explicitly that health IT are medical devices with definite, but unknown, levels of risk - FDA stats "may represent only the tip of the iceberg in terms of the HIT-related problems that exist" were the exact words. That is prima facie evidence the devices are experimental. However FDA refrains from regulating them under the FD&C Act, as they do pharma IT, other medical devices, drugs, etc. because they are a political "hot potato" - as at http://hcrenewal.blogspot.com/... , http://hcrenewal.blogspot.com/..., and http://hcrenewal.blogspot.com/... ). As is customary at Healthcare Renewal, at those three posts are links to source, quoted in full context. I've replied to so many irrationally exuberant commenters on this very blog, that I could have authored the reply above in my sleep. 2. The health IT irrationally exuberant, being irrational, ill-informed, and often markedly resistant to education, need to be removed from healthcare entirely. Their cavalier attitudes about cybernetic medical experiments are dangerous, and have no place in medical affairs. Such people impede, rather then help remediate the quality, safety, usability, and efficacy of health IT. In doing so, they contribute to increased risk and to actual patient harm. The irrationally exuberant are part of the problem, not part of the solution. We recently discussed why health care's 99 percent may have reason to be upset with the one percent, the elite that run health care organizations. Once cross-posted on the KevinMD blog, it caused an eruption of controversy. This included some anonymous commentators who insisted that top leaders' made contributions to health care that were so heroic that their compensation was insufficient. So conveniently an article this month in the Washington Post dissected the mechanisms that let pay of top health care leaders inexorably rise whatever their and their organizations' performance. It used as an example the compensation given to Kevin W Sharer, the CEO of Amgen, the biotechnology and pharmaceutical company. Sharer, a 63-year-old former Navy engineer, was already earning lots of money — about $15 million in the previous year, plus such perks as two corporate jets. The board decided to give Sharer more. It boosted his compensation to $21 million annually, a 37 percent increase, according to the company reports. This outsize compensation has allowed Mr Sharer to live large. He owns at least three homes, according to property records: a $2 million home in Los Angeles, a $6 million spread in Vail, Colo., and a $5 million place on Nantucket. This huge raise on top of an already huge compensation package, however, seemed completely unrelated to the performance of the company Mr Sharer lead. Shareholders at the company, one of the nation’s largest biotech firms, had lost 3 percent on their investment in 2010 and 7 percent over the past five years. The company had been forced to close or shrink plants, trimming the workforce from 20,100 to 17,400.
by 2006, the growth that once distinguished Amgen had begun to taper off. In 2008, Forbes magazine named ... [Sharer] among among the country’s most overpaid bosses because the company’s returns had dipped 4 percent annually over six years while he’d earned an average of $12.3 million. The lack of enthusiasm was even more noticeable among the people who know most about Amgen — insiders. Companies are required to report when their officials sell stock. Since 2002, the ratio of share sales to purchases has been 12 to 1, according to Bloomberg data reviewed last fall by Christopher. The Post article then analyzed the process used to set CEO pay at Amgen, and at many other corporations and organizations, and how it lead to such extreme results. This is how it’s done in corporate America. At Amgen and at the vast majority of large U.S. companies, boards aim to pay their executives at levels equal to or above the median for executives at similar companies. The idea behind setting executive pay this way, known as 'peer benchmarking,' is to keep talented bosses from leaving. It wasn’t until recently, however, that its pervasiveness and impact on executive pay became clear. Companies have long hid the way they set executive pay, but in late 2006, the Securities and Exchange Commission began compelling companies to disclose the specifics of how they use peer groups to determine executive pay. Amgen selected 11 companies in the biotech/pharmaceutical field, which seems natural enough. But most of the companies on the list are far larger than Amgen. Amgen’s revenue in 2010 was $15 billion; the median revenue of its peer companies was $40 billion, according to Equilar. The practice of choosing peers that boost pay is common. Studies by Faulkender, Bizjak and ISS Corporate Services have shown that when choosing 'peers' for pay-setting purposes, companies tend to choose larger firms or firms with more highly paid chief executives. Maybe even more significantly, however, the Amgen compensation committee also decided that Sharer, despite being at a smaller company, should earn stock compensation at the 75th percentile of peers. This is critical because stock compensation tends to be the largest component of executive pay. What is missing in the Post article is any rationale for the assessment that Sharer was doing so much better than the median CEO of these questionably comparable companies. The information presented in the article suggested instead that the company was doing badly, with decreasing revenue, decreasing share prices, and declining employment. The practice has persisted because corporate board members, many of whom have personal or business relationships with the chief executive, have been unwilling to abandon the practice. At Amgen, for example, four of the six members of the board compensation committee had personal or business connections to Sharer before joining the board. In fact, he nominated at least two of the six to the board, according to a company source and reports. These kinds of ties — between chief executives and the boards that oversee them — permeate corporate America. On a typical board, the chief executive considers about about 33 percent of the board of directors as “friends” rather than as mere “acquaintances,”according to a survey of chief executives at about 350 S&P 1500 corporations conducted over 15 years by University of Michigan business professor James Westphal. More tellingly, the chief executive is likely to find even more friends on the compensation committees of corporate boards — almost 50 percent. But the practice has long been controversial because, as critics have pointed out, if every company tries to keep up with or exceed the median pay for executives, executive compensation will spiral upward, regardless of performance. Few if any corporate boards consider their executive teams to be below average, so the result has become known as the 'Lake Wobegon' effect. Since then, researchers have found that about 90 percent of major U.S. companies expressly set their executive pay targets at or above the median of their peer group. This creates just the kinds of circumstances that drive pay upward. Moreover, the jump in pay because of peer benchmarking is significant. A chief executive’s pay is more influenced by what his or her 'peers' earn than by the company’s recent performance for shareholders, according to two independent research efforts based on the new disclosures. One was by Michael Faulkender at the University of Maryland and Jun Yang of Indiana University, and another was led by John Bizjak at Texas Christian University. The gap between what workers and top executives make helps explain why income inequality in the United States is reaching levels unseen since the Great Depression. Since the 1970s, median pay for executives at the nation’s largest companies has more than quadrupled, even after adjusting for inflation, according to researchers. Over the same period, pay for a typical non-supervisory worker has dropped more than 10 percent, according to Bureau of Labor statistics. Critical to executive pay levels is peer benchmarking. Even before the extent of the practice was known, it drew criticism from prominent business figures. After the Enron scandals, a blue-ribbon committee led by Peter G. Peterson, then chairman of the Federal Reserve Bank of New York, and John Snow, former chairman of the Business Roundtable, called for setting executive pay 'unconstrained by median compensation statistics.' Legendary investor Warren Buffett, in one of his famously plain-spoken letters to investors, likewise derided the method. 'Outlandish ‘goodies’ are showered upon CEOs simply because of a corporate version of the argument we all used when children: ‘But, Mom, all the other kids have one,’' he wrote. Peer benchmarking, as it currently is implemented, is an irrational system that has nothing to do with the free market. It shows how perverse the incentives given to top health care leaders have become. It shows how top hired executives of health care organizations are no longer are accountable to anyone. The boards that are supposed to exercise stewardship over them have become their cheerleaders, possibly because they are populated by cronies, and current and former hired executives of other organizations who are more interested in preserving the wealth and power of hired executives than representing shareholders, or upholding organizations' missions. - Paying the leaders so well (and supporting the public relations staff who sing their praises) costs money that could better be used to improve patients' and the public's health. - Providing such perverse incentives, which seem entirely unrelated to the organizations' primary missions, is likely to distract leaders from the organizations' abilities to support these missions. - It is likely that employees of such organizations who actually try to uphold the mission will be demoralized by the realization that their leaders' enrichment comes first, further damaging the organizations' ability to uphold the mission. So, ad infinitum, I repeat.... health care organizations need leaders that uphold the core values of health care, and focus on and are accountable for the mission, not on secondary responsibilities that conflict with these values and their mission, and not on self-enrichment. Leaders ought to be rewarded reasonably, but not lavishly, for doing what ultimately improves patient care, or when applicable, good education and good research. On the other hand, those who authorize, direct and implement bad behavior ought to suffer negative consequences sufficient to deter future bad behavior.